Adorned with heavy gold medallions, stone-studded rings, and a carved wooden staff, saxophonist Kamasi Washington certainly embodies the cosmic spirit of spiritual jazz. Channelling his forebears Sun Ra and Pharoah Sanders, his debut LP, 2015’s The Epic, was a three-hour sonic journey through afro-futurism and choral power, informed by a series of prophetic dreams Washington had during the recording process. He’s since played on Kendrick Lamar’s To Pimp A Butterfly, exposing a new audience to the raging intensity of his tenor, a hip hop fusion informed by the work of Grammy-winning pianist Robert Glasper and informing the ensuing eclecticism of UK jazz newcomers like Ezra Collective and Moses Boyd. Born and raised in South Central LA, Washington has stayed faithful to the scene there, scoring his first job while at college with West Coast hip hop’s first son, Snoop Dogg. His current band and collaborative partnership, the West Coast Get Down, is similarly comprised of childhood friends and cornerstones of the city’s musical community, including Thundercat, his brother the drummer Ronald Bruner Jr. and bassist Miles Mosley. Marked by his measured tone of voice, Washington is a man who thinks carefully about his music and its political import. Once heralded by critic Greg Tate as “the jazz voice of Black Lives Matter”, his work is envisioned as more than a mere commercial enterprise: it’s a space to think in, to create from, and to empower. Ahead of the release of Heaven and Earth, we spoke about the transformative potential of music, the fearlessness of Kendrick Lamar, and imagining the world the way we want it to be. How did growing up in South Central LA influence you musically? Kamasi Washington: West Coast hip hop was the sound of my neighbourhood. It was something I could relate to because it had a sound that felt like my surroundings – almost more so than what they were saying. That music was made to be bumped in a Cadillac! My dad’s also a musician, so jazz was always around the house. When I was 11, I developed an interest in it and he took me to Leimert Park. At that time, it was the artistic hub of LA, and it was right in South Central. The first concert I went to I saw Pharoah Sanders at the World Stage club there, which only holds like 30 people. I became one of the Leimert Park kids. There was also a hip hop club called Project Blowed and we’d see groups like Freestyle Fellowship and The Pharcyde. A lot of really great musicians were hanging out in that area and it became my musical upbringing. Were the hip hop and jazz scenes connected in Leimert Park at the time? Kamasi Washington: They were absolutely connected. People like Myka 9 (of Freestyle Fellowship) and Josef Leimberg were really into (jazz pianist) Horace Tapscott and were influenced by him. The jazz groups would also have poets accompanying them. It was one community and it wasn’t separated at all; the jazz musicians would go to the gospel jam session and vice versa. When I first started playing with Snoop Dogg, his whole band was jazz musicians, so there was a lot of cross-pollination. The musicians I really looked up to as a kid were the ones who could play everything. Were you also aware of a political charge to the music coming out then? Kamasi Washington: Oh, absolutely. N.W.A. was the first time that people who were from the hood were speaking about what was happening in there. Then you had Horace Tapscott who was speaking another kind of rhetoric from that neighbourhood. He was all about community building, putting his career on hold to create the Pan African People’s Arkestra. It was a group led by this world-renowned musician who left the doors open to anyone in the community who wanted to be a part of it. That saved a lot of lives. That notion of the music serving the people is something that’s ingrained in Leimert Park, and it’s something that’s been passed on to me. As a young African American man, did you feel pressure to succumb to a certain image of how you should be? Kamasi Washington: Definitely, and it’s something that gets you when you’re really young. I was in elementary school and we thought we were going to be little gangsters, before we even really knew what a gangster was. We idolised the personification of it. I was very blessed that at a young age a program came to my school, Ujima, which taught us about our history and gave us another version of who we could be. It was great because I got to redefine who I was, but I saw other friends who didn’t have that same opportunity, who didn’t get to change their inner image and they went down that path we were being led on. Finding music at the same time was what really kept me out of that. Was spiritual jazz always something that appealed or did you come to it later? Kamasi Washington: That was my dad’s thing – he was into (John) Coltrane and Pharoah Sanders, Eric Dolphy and Horace Tapscott. When I started saxophone, my dad took me to my uncle’s church and I started playing there too. At its best, music serves a greater purpose and that showed me a whole other side to spiritual jazz, one which you can hear in the music – the gospel and blues feel, the soul that’s embedded into the more avant-garde records. A lot of people don’t register that, but it’s there and it’s heavy. Is music a way of living for you? Kamasi Washington: As you live, your life comes through your music. I always put life above music and to me, music comes from life and then inspires it in turn. Your music is a reflection of who you are, so if you want your music to be a certain way, you have to be that way, otherwise it won’t feel authentic. What can you tell us about your next record, Heaven and Earth? Kamasi Washington: The inspiration for that is this idea I had that the world is the way we imagine it to be, but it’s also informed by the way we experience it. So, Earth are the songs that came from my own experiences of life, and Heaven are the songs of how I imagine life. The journey, you realise, is one and the same: how you imagine the world affects how you experience it. The world your mind lives in, lives in your mind. The two sides of the record happen simultaneously and coming to a balance of those is what forms your life. 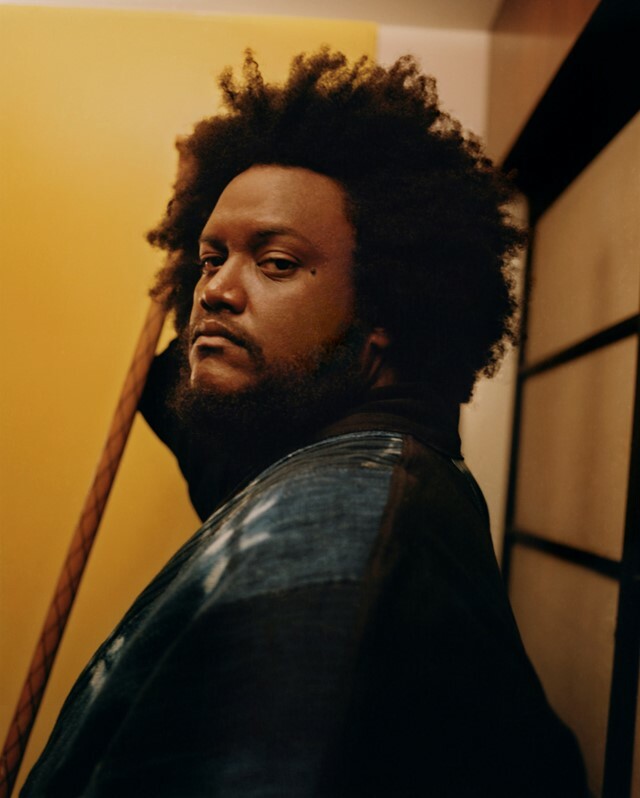 Kamasi Washington: It was different because we started in May 2016 when no one else from the band had yet released their prior recordings from The Epic sessions. I was the only one ready to go back in and record some loose stuff. When you bring a song into the studio, it’s like you’ve found this jewel from the mountain, and we all just stare at it and try to figure out what we can do with it! Each song would start with an hour and a half conversation at the piano, figuring out what it should be or what it can be and then we would go and throw it off the hills and watch it fly. What was it like working with Kendrick Lamar? Did he approach his music in a similar way? Kamasi Washington: It was really influential because Kendrick is such a fearless artist. When I came into the record, I realised that he had thrown it in a totally different direction to what had gone before. Not many other artists will do that, reinvent themselves completely at the height of their success. He’s always so true to his art and just does what he wants to do. What is happening in your life now to inspire your recent work? Kamasi Washington: Where I’m at in my head and heart is that I feel we need a sense of empowerment. As a citizen of the world, I have experienced powerlessness a lot; the world is moving in a way I don’t want it to go and I have no real say over it, from Trump to the negativity around immigration. Yet, we each have power over the small worlds that we live in, and as we imagine our world in a certain way, it will start to be that way. Even though music is just sound, it can move people and it can open people’s minds. If everyone is doing what they can do to make the world the beautiful place they want it to be, it’ll do a lot more than we may think. I’m at the place now where my music is an extension of who I am, so I’m constantly searching within myself for my identity and beliefs, which I put into the music. Once you get past all the scales, the chords, and technique, all you really have is your thoughts, and that will determine what your music really is.